The first edition of our new, weekly Nikonians Newsflash podcast with your host Jessica is now out. She informs you about the latest in the Nikonians community and noteworthy from the photography and imaging industry. Meet Nikonian Pascal Baetens and more than 50 other photographers showing their work at the Salve Mater Photo Festival in Belgium, running until May 7th. Get the chance to meet and greet models, participate in workshops and more. Tomorrow, May 1st, Pascal holds a workshop on how to create a professional relationship between photographer and model. Photographyblog reports on the release of the Nikon Coolpix Digiscope 8.1 Photo Package - a Coolpix P4, a 16x/24x/30x eyepiece adapter and a Digiscope P4 Camera Adapter Bracket - all for USD729.95 (MSRP). When combined with one of Nikon's award-winning Field Scopes like the 82mm ED, the Coolpix achieves a focal-length equivalent of a 1,080-3,780mm lens; perfect for wildlife or birding photography. 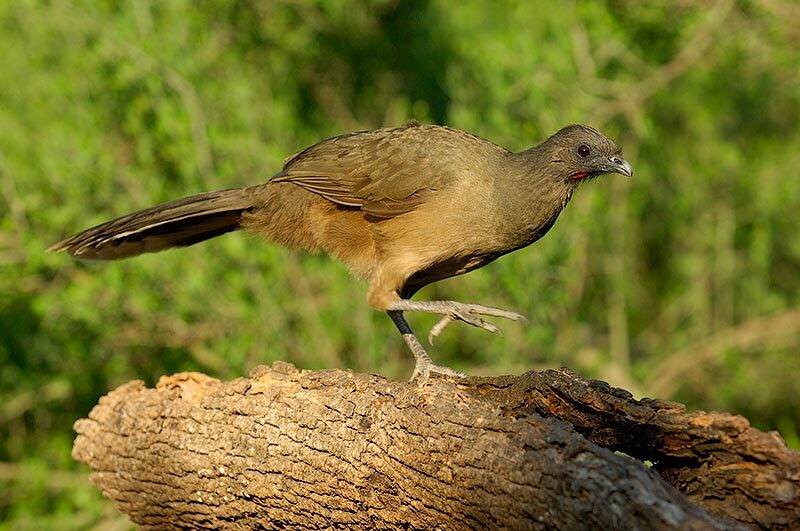 Click here for more information on digiscoping. The 2006 Technical Image Press Association (TIPA) awards have singled out DxO Optics Pro 3.5 as "Best Photo Software." TIPA awards are regarded by the whole photo industry as the equivalent of the "Oscars," and it's remarkable that DxO Optics Pro could have won this award less than two years after its commercial launch. TIPA is an association of 31 photo magazines from 12 countries. DxO Optics Pro has also recently won an award from the British Institute of Professional Photography (BIPP), and was awarded the Digital Focus "Innovation Award" at PMA 2006. Nikonians member Neil van Niekerk has published his review, available in our Nikonians Resources library. Rick and Jason discuss metering and exposure modes with Nikon SLRs, including tips on when to use each mode, how a light meter works, and more. We then continue our series on RAW converters with a discussion/review of Raw Shooter. Download The Image Doctors for (April 27th, 2006): NPC-ID-2006-04-27.mp3 (41:42, 19.6 MB, mp3 format). Nikon SLRs offer three metering modes: Matrix, Center-weighted, and Spot. In today's show, we discuss the differences between these modes, how and when to use them, and we offer some tips on getting good exposures with film and digital cameras. In a continuation of our multi-part series on RAW conversion, we take a closer look at Raw Shooter, a product offered in two versions from Pixmantec. Raw Shooter Essentials is a 100% free RAW converter, and does a good job at converting Nikon NEFs. A more full-featured version, Raw Shooter Premium, is available for $89.95 USD. The initial results from the 2006 RAW Survey have now been released. Based on the feedback from over 19,000 photographers representing the professional and enthusiast segments of the industry, the results are still being analyzed and the report will be released in chapters over the course of the week beginning April 25th, 2006. Every so often, we'll find and highlight tidbits from our forums posted by members that are useful or interesting. Today's first tidbit comes from member Mallaig who brings attention to a Nikon Capture utility that addresses the license key conversion problem in 4.x for owners who had legacy alphabetic codes only. Our second tidbit is from member RYnikon thanking veteran member Bob Johnson for his Photoshop Goodies actions that help bring back Curves and other features missing from Photoshop Elements. ...you're wearing one of our newest T-shirts! 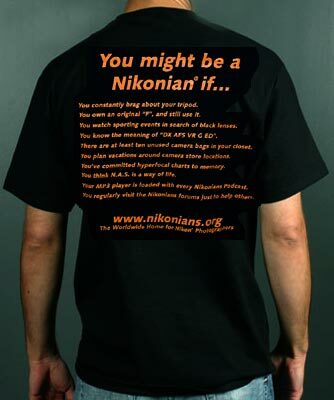 Specifically, our snazzy and stylish "You Might Be A Nikonian If..." Tee has the Top 10 Signs that you're one of the proud members of this community. The shirt is made of 100% cotton and is rendered classic orange text on a black background. To complement your shirt, make sure you're also carrying one of our Spudz polishing kits. 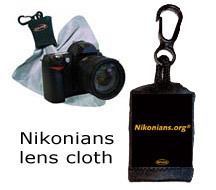 Customized with the Nikonians logo, it's a 10x10 black microfiber cloth that conveniently clips to your bag or belt and will make you the envy of your shutterbug friends. 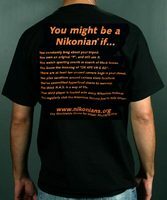 Visit our Pro Shop today to get these and other high-quality Nikonians merchandise. Nikon has revised their financial forecasts for the year ending in March 2006 and the outcome is quite optimistic. Other channels report that Nikon is on-track to double profit to 66B Yen (USD576M) based on last year's performance; an increase of about 7B Yen and well above the market's call of about 57.1B Yen. Notes in the latest revision indicate suprisingly strong performance in the tight compact digital market, bolstered by core businesses such as the stepper segment and the higher-end Digital SLR area. Nikonians member Darrel Young has prepared a step-by-step explanation of the Image Dust Off feature available in Nikon Capture 4. This is a handy guide to the exclusive feature that uses a reference image to remove what we have come to know as "dust bunnies." His instructions, using a D2X, explain how that model (and many others) can locate dust bunnies on sensors and automatically remove them from Nikon Electronic Format (NEF) images. Thanks to member Harry Amloian, Nikonians has confirmed that Fujifilm USA has halted the S3 Pro Buffer Upgrade that we had originally reported in March. Based on discussions with the Edison, NJ depot, Fujifilm Japan has allegedly issued the stop order, but it is unclear at this time whether it is permanent or not. A parts shortage is suspected, but there may be other factors influencing the decision. S3 owners should call the facility towards the end of next week to get more information on the final disposition. Imaging News has broken the story that Mamiya has sold off it's optical division, having found that digital cameras and in particular digital SLRs, had made it's medium format line overly expensive and unprofitable. The departure marks yet another industry giant casualty from the inevitability of digital conversion. Mamiya had recently launched the ZD SLR in hopes of regaining market share. However, the board of directors was not swayed after noting four consecutive quarters of steadily declining losses, and announced the sale of the optical instruments business to Cosmos Scientific Systems Inc. Pending a June approval by shareholders, the sale will be concluded by September of 2006. As part of the deal, Cosmos will take on all unit assets, patents, trademarks, certain debts and post-sales support responsibilities. Mamiya did not disclose any figures around job losses but notes a "considerable number" of employees will transfer to Cosmos as part of the sell-off. Nikonians is pleased to announce that Roberts Distributors has joined our team as a Corporate Partner for 2006. The friendly people and excellent service from Roberts are worth checking out for yourself. Thanks to Roberts for their support of this community! Go behind the lens with Claus Brandt, 2005 European Wildlife Photographer of the Year. Claus is not only an award-winning photographer, but he's also an active member at Nikonians. 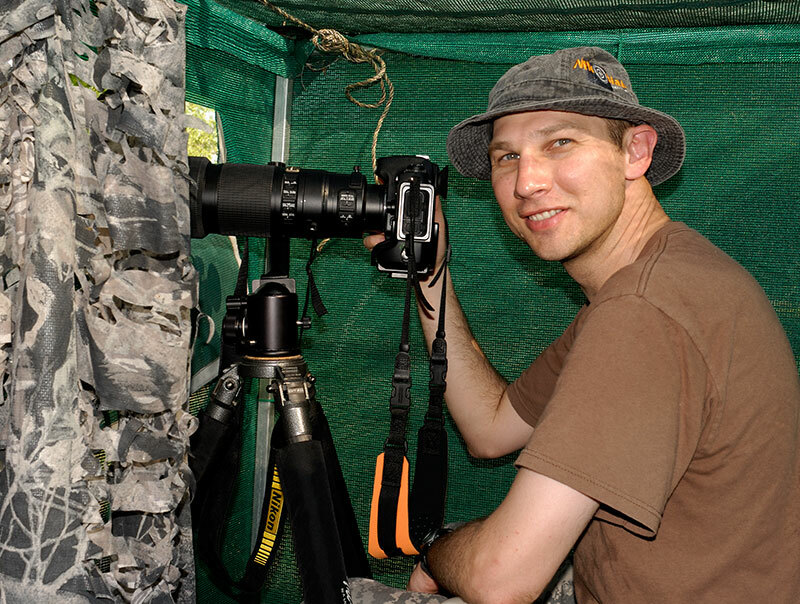 Hear Claus' tips for successful wildlife shots! Join us as your host, Brian Tilley, spends some quality time with Claus Brandt. 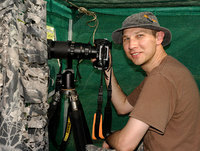 Claus won the 2005 European Wildlife Photographer of the Year award, and is an active member at Nikonians. 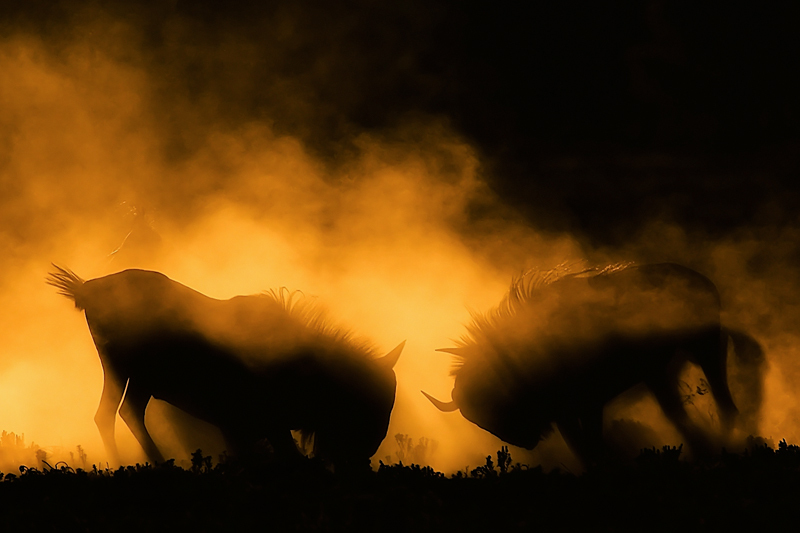 Claus' image of wildebeest at sunrise is absolutely stunning. Each year, Claus organizes and runs several wildlife photography workshops, including the Nikonians Helgoland Expedition, where birds and seals are well within your camera's reach. You can find out about how you can join Claus on his other tours at his website. You can learn a little more about Claus on his Nikonians Workshops Faculty Page. [MP3] Download the show as MP3. Sigma has launched a new line of multi-coated filters optimized for use on digital SLR cameras. The product line consists of UV (clear) filters for reducing ultraviolet light as well as general protection, and circular polarizers in wide/thin and normal configurations. The wide/thin CPL line covers all standard Sigma lenses from 52-82mm front threads, with normal CPLs covering 86, 95 and 105mm front threads which match the larger telephoto lenses like the famed 50-500 and 120-300. UV filters are available in all the aforementioned threads. For our members who also share the joy of Leica ownership, there are reports that the legendary camera maker will open a self-owned store in Tokyo's Ginza district. The store will feature full-line sales, service and high-end printing. A commemorative and limited edition M3J (200 copies) will be sold in conjunction with the inaugral. It's been a tough year for the Big Yellow Box - and now Philips has weighed in saying that the Kodak has infringed upon a 1990 patent that the electronics conglomerate holds regarding the compression of JPEG images in DVD players, medical scanners and digital still cameras. Philips has already licensed this technology to Canon and Sony among others. The embattled imaging manufacturer has stated it would defend itself "vigorously" in court. Macworld reports that Adobe is now offering a DNG Software Development Kit (SDK) for third-party firms to allow reading, writing and conversion to the proposed industry format. Nikon announced this morning that the much-anticipated updates to the Capture RAW editor and View programs has been pushed back to mid-year. Orginally, both programs were due to be released next month (May 2006). Capture NX has been pushed back to July and View Pro is undetermined at this time. Nikon cited "delays in development schedule" as the cause. Rob Galbraith's DPI forums have closed due to owner workload requirements. Rob is currently in the process of selling off the discussion boards to interested third parties that would provide continuity. No other sections of the DPI website are for sale. Newsline International and other channels are reporting that Kodak's Graphics Communications Group has announced a two-digit increase price increase on film, printing plates, proofing material and other prepress consumables. The imaging manufacturer cites rising energy and raw materials costs as the cause of the price hike. Details are still being formulated, but a country-by-country notification will follow shortly. Participate and include your work in the Nikonians Photo Contest, gain recognition and get the chance to win great gear, software and more. The 2005 winners took home Nikon D70s cameras, professional Tamrac backpacks and more. Don't wait and join the contest today! Open to all Silver, Gold and Platinum members. More information about Nikonians Photography Contest. The 6th Annual Nikonians Photo Adventure Trip (ANPAT) venue has been determined. We are returning to the Smoky Mountains National Park located in South Tennessee and North Carolina, USA. The trip will run from 21-October to 28-October, and participants will enjoy capturing the fall foliage, landscapes and waterfalls of this scenic location. Congratulations to Nikonian member Guy Cope (Guido) for having his image of Honda motorcycle rider Ryuichi Kiyonari in competition at Brands Hatch Circuit published in NPS Europe's NikonPro magazine. You can see more of Guy's exciting shots in his gallery. Excellent job, Guy! SanDisk announces it's 2006 Red Sea Underwater Photography Competition, which takes place in Eliat, Israel from April 24-29th. The main contest will be with the Eliat competition, where divers will take to the waters of the Red Sea to get the best photo. For shooters not able to travel, the Images of the World shootout is offered, where you can send in your best frames from home. The grand prize, however, will only be awarded to an Eliat participant, and what a whopper it is - USD10000 in cash and a three week diving trip for two to Papua New Guinea. Nikon has replaced Tommy Hilfiger as the official named sponsor for the Jones Beach Theater in Long Island, New York. The clothing manufacturer's name will come off the 15,000 seat amphitheater this week, after three years of prominence. The venue operates a well known summer concert series in conjunction with promoter Live Nation, and this year's acts include Nine Inch Nails, Depeche Mode, Jimmy Buffett and Kelly Clarkson. Aperture's 1.1 version is now compatible with Intel-based Macintosh hardware, and introduces enhanced RAW Fine Tuning and export controls, as well as Nikon D200 and Canon 30D file support. Apple has also cut the price by USD200; the program will now retail at USD299 and previous buyers are eligible for a rebate coupon that can be used at the Apple Online Store.. 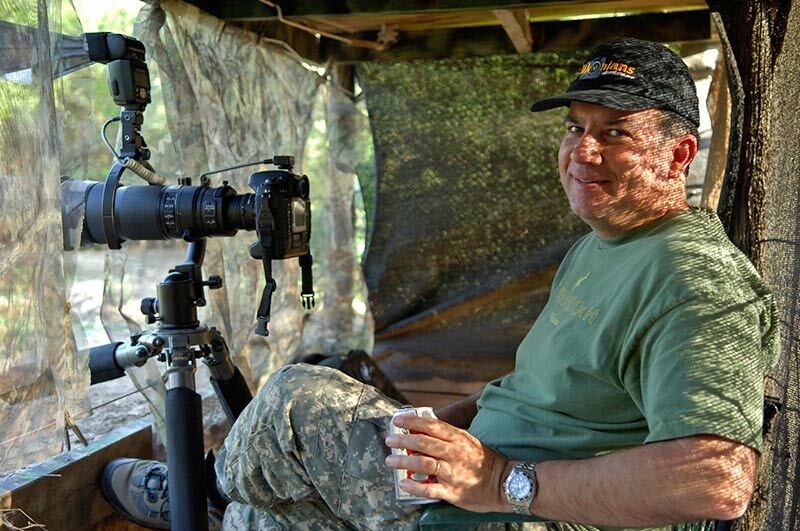 In this podcast, we talk about our four-day shoot in South Texas, USA. We had a great experiencing shooting from specially-designed photo blinds on private lands as guests of Lens and Land, a consortium of landowners who are opening up their property to photographers in an effort to promote conservation of the Rio Grande Valley region. Download The Image Doctors for April 13, 2006: NPC-ID-2006-04-13.mp3 (46:20, 18.9 MB, mp3 format). We flew to McAllen, Texas for several days of shooting on private ranches as guests of John and Audrey Martin. In an effort to promote conservation, a group called Images for Conservation (ICF) has been formed. Private landowners are encouraged to create photo opportunities on their properties and invite photographers to spend time at their property. The benefits are two-fold: landowners generate a revenue stream by maintaining native habitat, and photographers are rewarded with a shooting experience that just isn't possible in public areas. 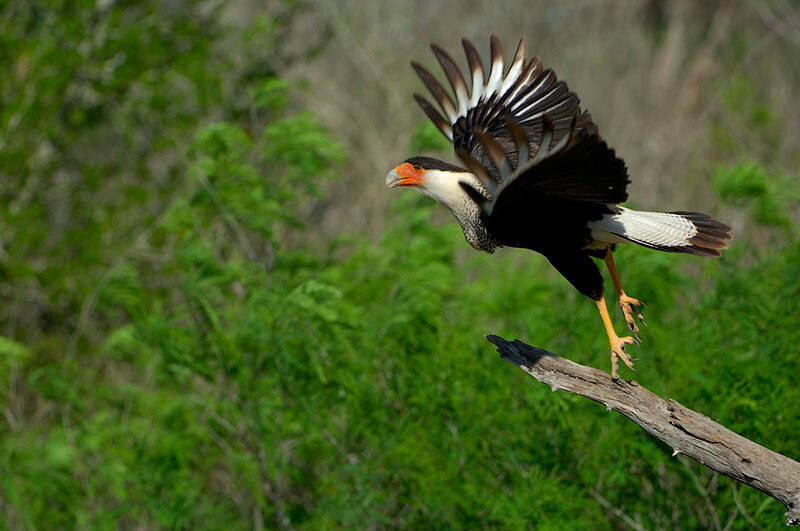 To find out more about photographic opportunities in Texas, visit South Texas Lens and Land or Images for Conservation. Rick Walker hard at work at Dos Venadas (Steve Bentsen's Ranch). Nikon has launched a new marketing campaign around controversial supermodel Kate Moss and the Coolpix S6. Members can view the Flash teaser at stunningnikon.com. As evidenced by the style of the ad as well as Moss' lack of acoutrements, Nikon is clearly taking aim at the younger and hipper crowd of purchasers that make up the mass market. In addition to the Internet presence, Nikon is planning a series of print and TV ads to coincide with the May "sweeps" that marks the season finales of regular television shows. Viewers can also go online to bid on Moss owned items, and get fashion tips from the supermodel diva. Congratulations go out to our collegues at Letsgodigital - today they have launched their 6th multilingual edition, this time in German. Great job folks! The National Park Service has taken the extreme step to forbid photography inside the famed Carlsbad Caverns. The Park Service wants to prevent further disruption to the native bats that inhabit the caves. Despite strong enforcement, visitors persisted in using flash and bright video lights that caused disorientation to the bats during their evening flights. The April 2006 Nikon newsletter has several items of interest to our members: there is a new Speedlight Digitutor module, with a "Just Try" section which simulates common uses of the Creative Lighting System, an expanded section on Capture NX, including a non-functioning download link which may portend availability in the near future, and a notice that the D2X's USD500 rebate has been extended through 30-June-2006. The 2005 Nikonians Photographers of the Year have been selected, and it was a very well-represented field of the best talent among our community of artisans. Congratulations to the finalists! Our thanks also go out to all our members who participated and to Nikon and Tamrac for contributing generous prize packages. "The Image Autumn Leaf came about when I was walking my daughter home from school. She saw some beautiful Autumn Leaves and wanted to pick them. As she held them up to her face I was amazed the colours of the leaf were similar to her lips. I wanted to capture this to share with some friends." "A great and simple idea, well executed. Good composition and a strong expression make for a bold image that has cover potential." "Bold, unique and fun. An excellent concept on the part of the photographer." "My D2X was new, and it was a chance to test the high speed mechanism of that camera. I've used a Sigma 500/4 lens to shoot some of the doves sitting on a small rock. When they flew away I've made several shots and I was very pleased by the results. So: Even if you're in a boring situation and there are only birds around you - your D2X makes the best out of it." "A graceful image that becomes almost abstract in nature due to the alignment of the wings. A unique image of a familiar subject." "A very good example that timing is everything." "The colors are what the viewer will notice first, but the fact that you can see the eyes on all the subjects is what really makes this image a winner." "Deep blacks and vibrant colours combine in this dazzling image of these women who are obviously beautiful, but hidden from our eyes." "Excellent composition enhances this evocative landscape. I like how the composition allows your eye to roam around the image." "This simple title doesn't do justice to this wonderful shot. Fragile little bird in what seems like extremely tough conditions make for a nice contrast. Black and white is perfect choice for this world of snow and silhouettes." Well, you sure caught the peak of the action! And the interesting players are crisp and colorful. Red, blue, yellow, green - it's a colorful picture, without being overt. I think that's what makes the picture cool. What's lacking is that I think there are at once too few things and too many things! The full critique can be seen here. Our workshops in April and May covering Adobe Photoshop and Nikon Capture still have slots available. Classes are being held in Houston, Dallas and Ft. Lauderdale. Letsgodigital has updated their memory chart with all available SanDisk flash cards, including individual capacity information based upon compressed and uncompressed images. Nikon will be exhibiting some of it's finest examples of industrial design at the 50th Anniversary of the Good Design Awards in Milan. Items on display will include the Nikon F, the D2H, F6 and the special F3 camera designed for NASA; as well as Coolpix prototypes, binoculars and eyewear. Kodak has launched a free tool allowing photographers to insert up to five of their favorite photos and view them in the well-known TV spot "Kodak Gallery" commercial. The ad can be shared via e-mail and seen for up to 30 days. The Zeiss Online Store is now open for business and the much-awaited ZF-mount lenses are available for purchase. At the recent Photographic Imaging Expo in Tokyo, Tokina showed off the latest mockups of their lens lineup for this year, including the new 50-135/2.8 DX and the 16-50/2.8 DX. Those images are now available on their news page. Professional and advanced amateur photographers are praising a new computer software release that acts as a customized digital enhancer. Nikonians are now sharing a detailed hands-on review of this latest offering from DxO Labs. The Paris-based software company, specializing in digital image enhancement technologies recently unveiled DxO Optics Pro version 3.5, and Nikonian Neil van Niekerk has been testing it with images captured under a variety of professional shooting conditions. His review, now posted in the Nikonians Resources library provides a step-by-step description of the software's ability to match specific camera and lens data with pre-set algorithms to maximize the digital yield from each frame with a few keystrokes. The DxO Optics Pro Software acts like a virtual optometrist, correcting minor lens and camera deficiencies in even the most expensive and complex systems. The "corrections" are made possible because the DxO developers have the technology to prove what professional photographers have known for decades. No lens or camera combination will ever be "perfect." In his review, van Niekerk quickly points out the DxO software, which also corrects color shifts and light level challenges, is not a replacement for industry standard photo preparation software like Adobe PhotoShop or Nikon's Capture Editor. "Even where some corrections are available in Photoshop, such as correction of chromatic aberration - you'd still have to manually do it by checking the image," he writes. "DxO Optics Pro does it automatically for you depending on various factors such as the specific lens, the focal length it was zoomed to, and the focusing distance. The wizards at DxO Labs did your homework for you." As a professional wedding and studio photographer shooting with both Nikon and Canon digital single lens reflex cameras and an assortment of lenses, van Niekerk heartily recommends the DxO Optics Pro as a "remarkable tool for the digital photographer." - It runs on both Mac and Windows platforms, and works on raw or jpg image. - Using expert controls you can fine tune: Distortion, Chromatic Aberration, Vignetting, Lighting, Noise, Colour & Exposure (which contains WB / exposure / Curves / Hue / Saturation / Lightness controls), Image Information (which shows the Exif Data), Output Settings (which controls output file format and colour space), Sharpening and the Histogram. The Nikon F2 and the Nikkormat EL! 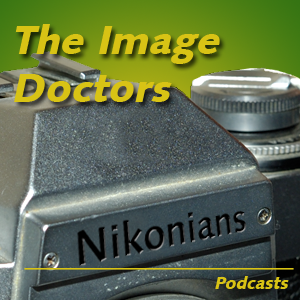 Download The Image Doctors for April 1, 1973: NPC-ID-2006-03-30.mp3 (29:07, 13.8 MB, mp3 format). In this episode, sponsored by GAF slide film, Rick and Jason discuss two of the newest Nikon products: The F2 and the Nikkormat EL. Is the F2 a worthy successor to the F? Has the Nikkormat EL "lowered the bar" with its automatic exposure mode? Listen to this vintage broadcast originally aired on April 1, 1973 on AM 870 KNKN Radio. Happy April 1st from the Image Doctors!